Melanopsin is a type of photopigment belonging to a larger family of light-sensitive retinal proteins called opsins and encoded by the gene Opn4. In the mammalian retina, there are two additional categories of opsins, both involved in the formation of visual images: rhodopsin and photopsin (types I, II, and III) in the rod and cone photoreceptor cells, respectively. In humans, melanopsin is found in intrinsically photosensitive retinal ganglion cells (ipRGCs). It is also found in the iris of mice and primates. Melanopsin is also found in rats, amphioxus, and other chordates. ipRGCs are photoreceptor cells which are particularly sensitive to the absorption of short-wavelength (blue) visible light and communicate information directly to the area of the brain called the suprachiasmatic nucleus (SCN), also known as the central "body clock", in mammals. Melanopsin plays an important non-image-forming role in the setting of circadian rhythms as well as other functions. Mutations in the Opn4 gene can lead to clinical disorders, such as Seasonal Affective Disorder (SAD). According to one study, melanopsin has been found in eighteen sites in the human brain (outside the retinohypothalamic tract), intracellularly, in a granular pattern, in the cerebral cortex, the cerebellar cortex and several phylogenetically old regions, primarily in neuronal soma, not in nuclei. Melanopsin is also expressed in human cones. However, only 0.11% to 0.55% of human cones express melanopsin and are exclusively found in the peripheral regions of the retina. The human peripheral retina senses light at high intensities that is best explained by four different photopigment classes. Melanopsin was first discovered by Ignacio Provencio as a novel opsin in the melanophores, or light-sensitive skin cells, of the African clawed frog in 1998. A year later, researchers found that mice without any rods or cones, the cells involved in image-forming vision, still entrained to a light-dark cycle. This observation led to the conclusion that neither rods nor cones, located in the outer retina, are necessary for circadian entrainment and that a third class of photoreceptor exists in the mammalian eye. Provencio and colleagues then found in 2000 that melanopsin is also present in mouse retina, specifically in ganglion cells, and that it mediates non-visual photoreceptive tasks. Melanopsin was found to be encoded by Opn4 with orthologs in a variety of organisms. The human melanopsin gene, opn4, is expressed in ipRGCs, which comprises only 1-2% of RGCs in the inner mammalian retina, as studied by Samer Hattar and colleagues. The gene spans approximately 11.8 kb and is mapped to the long arm of chromosome 10. The gene includes nine introns and ten exons compared to the four to seven exons typically found in other human opsins. In non-mammalian vertebrates, melanopsin is found in a wider subset of retinal cells, as well as in photosensitive structures outside the retina, such as the iris muscle of the eye, deep brain regions, the pineal gland, and the skin. Paralogs of Opn4 include OPN1LW, OPN1MW, RHO and OPN3 and were discovered by the Genome Project. Melanopsin, like all other animal opsins (e.g. rhodopsin), is a member of the G-protein coupled receptor (GPCR) family. The melanopsin protein has seven alpha helices integrated in the plasma membrane, an N-terminal domain and a C-terminal domain. It resembles invertebrate opsins far more than vertebrate photopigments, especially in its amino acid sequence and downstream signaling cascade. Like invertebrate opsins, it appears to be a photopigment with intrinsic photoisomerase activity and signals through a G-protein of the Gq family. Melanopsin-containing ganglion cells, like rods and cones, exhibit both light and dark adaptation; they adjust their sensitivity according to the recent history of light exposure. However, while rods and cones are responsible for the reception of images, patterns, motion, and color, melanopsin-containing ipRGCs contribute to various reflexive responses of the brain and body to the presence of light. Melanopsin photoreceptors are sensitive to a range of wavelengths and reach peak light absorption at blue light wavelengths around 480 nanometers. Other wavelengths of light activate the melanopsin signaling system with decreasing efficiency as they move away from the optimum 480 nm. For example, shorter wavelengths around 445 nm (closer to violet in the visible spectrum) are half as effective for melanopsin photoreceptor stimulation as light at 480 nm. Melanopsin in the iris of some, primarily nocturnal, mammals closes the iris when it is exposed to light. This local pupil light reflex (PLR) is absent from primates, even though their irises express melanopsin. The discovery of the role of melanopsin in non-image forming vision has led to a growth in optogenetics. This field has shown promise in clinical applications, including the treatment of human eye diseases such as retinitis pigmentosa and diabetes. A missense mutation in Opn4, P10L, has been implicated in 5% of patients with Seasonal Affective Disorder (SAD). This is a condition in which people experience depressive thoughts in the winter due to decreased available light. Additionally, a melanopsin based receptor has been linked to migraine pain. In a paper published by Ye and colleagues in 2011, melanopsin was utilized to create an optogenetic synthetic transcription device that was tested in a therapeutic setting to produce glucagon-like peptide 1 (GLP-1), a protein that helps control blood glucose levels in mammals with Type II Diabetes. The researchers subcutaneously implanted mice with microencapsulated transgenic HEK 293 cells that were cotransfected with two vectors including the melanopsin gene and the gene of interest under an NFAT (nuclear factor of activated T cells) promoter, respectively. It is through this engineered pathway that they successfully controlled the expression of GLP-1 in doubly recessive diabetic mice and reduced hyperglycemia, or high blood glucose levels, in these mice. This shows promise for the use of melanopsin as an optogenetic tool for the treatment of Type II diabetes. ^ a b c Hankins MW, Peirson SN, Foster RG (January 2008). "Melanopsin: an exciting photopigment" (PDF). Trends in Neurosciences. 31 (1): 27–36. doi:10.1016/j.tins.2007.11.002. PMID 18054803. ^ Provencio I, Warthen DM (2012). "Melanopsin, the photopigment of intrinsically photosensitive retinal ganglion cells". Wiley Interdisciplinary Reviews: Membrane Transport and Signaling. 1 (2): 228–237. doi:10.1002/wmts.29. ^ a b Xue T, Do MT, Riccio A, Jiang Z, Hsieh J, Wang HC, Merbs SL, Welsbie DS, Yoshioka T, Weissgerber P, Stolz S, Flockerzi V, Freichel M, Simon MI, Clapham DE, Yau KW (November 2011). "Melanopsin signalling in mammalian iris and retina". Nature. 479 (7371): 67–73. Bibcode:2011Natur.479...67X. doi:10.1038/nature10567. PMC 3270891. PMID 22051675. ^ Angueyra JM, Pulido C, Malagón G, Nasi E, Gomez Mdel P (2012). "Melanopsin-expressing amphioxus photoreceptors transduce light via a phospholipase C signaling cascade". PLOS ONE. 7 (1): e29813. Bibcode:2012PLoSO...729813A. doi:10.1371/journal.pone.0029813. PMC 3250494. PMID 22235344. ^ a b c d Hattar S, Liao HW, Takao M, Berson DM, Yau KW (February 2002). "Melanopsin-containing retinal ganglion cells: architecture, projections, and intrinsic photosensitivity". Science. 295 (5557): 1065–70. Bibcode:2002Sci...295.1065H. doi:10.1126/science.1069609. PMC 2885915. PMID 11834834. ^ a b Roecklein KA, Rohan KJ, Duncan WC, Rollag MD, Rosenthal NE, Lipsky RH, Provencio I (April 2009). "A missense variant (P10L) of the melanopsin (OPN4) gene in seasonal affective disorder". Journal of Affective Disorders. 114 (1–3): 279–85. doi:10.1016/j.jad.2008.08.005. PMC 2647333. PMID 18804284. ^ Nissilä J, Mänttäri S, Tuominen H, Särkioja T, Takala T, Saarela S, Timonen M (2012). "P-780 - The abundance and distribution of melanopsin (OPN4) protein in human brain". European Psychiatry. 27: 1–8. doi:10.1016/S0924-9338(12)74947-7. ^ Dkhissi-Benyahya O, Rieux C, Hut RA, Cooper HM (April 2006). 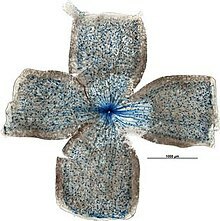 "Immunohistochemical evidence of a melanopsin cone in human retina". Investigative Ophthalmology & Visual Science. 47 (4): 1636–41. doi:10.1167/iovs.05-1459. PMID 16565403. ^ Horiguchi H, Winawer J, Dougherty RF, Wandell BA (January 2013). "Human trichromacy revisited". Proceedings of the National Academy of Sciences of the United States of America. 110 (3): E260–9. Bibcode:2013PNAS..110E.260H. doi:10.1073/pnas.1214240110. PMC 3549098. PMID 23256158. ^ Provencio I, Jiang G, De Grip WJ, Hayes WP, Rollag MD (January 1998). "Melanopsin: An opsin in melanophores, brain, and eye". Proceedings of the National Academy of Sciences of the United States of America. 95 (1): 340–5. Bibcode:1998PNAS...95..340P. doi:10.1073/pnas.95.1.340. PMC 18217. PMID 9419377. ^ Freedman MS, Lucas RJ, Soni B, von Schantz M, Munoz M, David-Gray Z, Foster R (April 1999). "Regulation of mammalian circadian behavior by non-rod, non-cone, ocular photoreceptors". Science. 284 (5413): 502–4. Bibcode:1999Sci...284..502F. doi:10.1126/science.284.5413.502. PMID 10205061. ^ a b c Provencio I, Rodriguez IR, Jiang G, Hayes WP, Moreira EF, Rollag MD (January 2000). "A novel human opsin in the inner retina". The Journal of Neuroscience. 20 (2): 600–5. doi:10.1523/JNEUROSCI.20-02-00600.2000. PMID 10632589. ^ a b c Berson DM, Dunn FA, Takao M (February 2002). "Phototransduction by retinal ganglion cells that set the circadian clock". Science. 295 (5557): 1070–3. Bibcode:2002Sci...295.1070B. doi:10.1126/science.1067262. PMID 11834835. ^ a b Panda S, Sato TK, Castrucci AM, Rollag MD, DeGrip WJ, Hogenesch JB, Provencio I, Kay SA (December 2002). "Melanopsin (Opn4) requirement for normal light-induced circadian phase shifting" (PDF). Science. 298 (5601): 2213–6. doi:10.1126/science.1076848. PMID 12481141. ^ a b c Bellingham J, Chaurasia SS, Melyan Z, Liu C, Cameron MA, Tarttelin EE, Iuvone PM, Hankins MW, Tosini G, Lucas RJ (July 2006). "Evolution of melanopsin photoreceptors: discovery and characterization of a new melanopsin in nonmammalian vertebrates". PLoS Biology. 4 (8): e254. doi:10.1371/journal.pbio.0040254. PMC 1514791. PMID 16856781. ^ Benton MJ (May 1990). "Phylogeny of the major tetrapod groups: morphological data and divergence dates". Journal of Molecular Evolution. 30 (5): 409–24. Bibcode:1990JMolE..30..409B. doi:10.1007/BF02101113. PMID 2111854. ^ Baraas, Rigmor (15 November 2012). "Substitution of isoleucine for threonine at position 190 of S-opsin causes S-cone-function abnormalities". Vision Research. 73: 1–9. doi:10.1016/j.visres.2012.09.007. PMC 3516400. PMID 23022137. ^ Tobin AB (March 2008). "G-protein-coupled receptor phosphorylation: where, when and by whom". British Journal of Pharmacology. 153 Suppl 1: S167–76. doi:10.1038/sj.bjp.0707662. PMC 2268057. PMID 18193069. ^ Panda S, Nayak SK, Campo B, Walker JR, Hogenesch JB, Jegla T (January 2005). "Illumination of the melanopsin signaling pathway". Science. 307 (5709): 600–4. Bibcode:2005Sci...307..600P. doi:10.1126/science.1105121. PMID 15681390. ^ Feigl B, Zele AJ (2014). "Melanopsin-expressing intrinsically photosensitive retinal ganglion cells in retinal disease". Optometry and Vision Science. 91 (8): 894–903. doi:10.1097/OPX.0000000000000284. PMID 24879087. ^ Wong KY, Dunn FA, Berson DM (December 2005). "Photoreceptor adaptation in intrinsically photosensitive retinal ganglion cells". Neuron. 48 (6): 1001–10. doi:10.1016/j.neuron.2005.11.016. PMID 16364903. ^ Bailes HJ, Lucas RJ (May 2013). "Human melanopsin forms a pigment maximally sensitive to blue light (λmax ≈ 479 nm) supporting activation of G(q/11) and G(i/o) signalling cascades". Proceedings of the Royal Society B: Biological Sciences. 280 (1759): 20122987. doi:10.1098/rspb.2012.2987. PMC 3619500. PMID 23554393. ^ Berson DM (August 2007). "Phototransduction in ganglion-cell photoreceptors". Pflügers Archiv. 454 (5): 849–55. doi:10.1007/s00424-007-0242-2. PMID 17351786. ^ Melyan Z, Tarttelin EE, Bellingham J, Lucas RJ, Hankins MW (February 2005). "Addition of human melanopsin renders mammalian cells photoresponsive". Nature. 433 (7027): 741–5. Bibcode:2005Natur.433..741M. doi:10.1038/nature03344. PMID 15674244. ^ a b al Enezi J, Revell V, Brown T, Wynne J, Schlangen L, Lucas R (August 2011). "A "melanopic" spectral efficiency function predicts the sensitivity of melanopsin photoreceptors to polychromatic lights". Journal of Biological Rhythms. 26 (4): 314–323. doi:10.1177/0748730411409719. PMID 21775290. ^ Zaidi FH, Hull JT, Peirson SN, Wulff K, Aeschbach D, Gooley JJ, Brainard GC, Gregory-Evans K, Rizzo JF, Czeisler CA, Foster RG, Moseley MJ, Lockley SW (December 2007). "Short-wavelength light sensitivity of circadian, pupillary, and visual awareness in humans lacking an outer retina". Current Biology. 17 (24): 2122–8. doi:10.1016/j.cub.2007.11.034. PMC 2151130. PMID 18082405. ^ Reppert SM, Weaver DR (August 2002). "Coordination of circadian timing in mammals". Nature. 418 (6901): 935–41. Bibcode:2002Natur.418..935R. doi:10.1038/nature00965. PMID 12198538. ^ Hannibal J, Fahrenkrug J (April 2004). "Target areas innervated by PACAP-immunoreactive retinal ganglion cells". Cell and Tissue Research. 316 (1): 99–113. doi:10.1007/s00441-004-0858-x. PMID 14991397. ^ Allada R, Emery P, Takahashi JS, Rosbash M (2001). "Stopping time: the genetics of fly and mouse circadian clocks". Annual Review of Neuroscience. 24 (1): 1091–119. doi:10.1146/annurev.neuro.24.1.1091. PMID 11520929. ^ Czeisler CA, Shanahan TL, Klerman EB, Martens H, Brotman DJ, Emens JS, Klein T, Rizzo JF (January 1995). "Suppression of melatonin secretion in some blind patients by exposure to bright light". The New England Journal of Medicine. 332 (1): 6–11. doi:10.1056/NEJM199501053320102. PMID 7990870. ^ Rollag MD, Berson DM, Provencio I (June 2003). 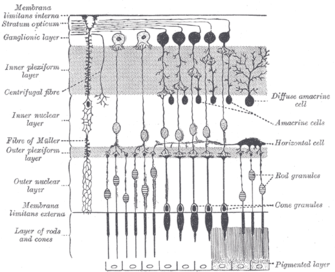 "Melanopsin, ganglion-cell photoreceptors, and mammalian photoentrainment". Journal of Biological Rhythms. 18 (3): 227–34. doi:10.1177/0748730403018003005. PMID 12828280. ^ Panda S, Provencio I, Tu DC, Pires SS, Rollag MD, Castrucci AM, Pletcher MT, Sato TK, Wiltshire T, Andahazy M, Kay SA, Van Gelder RN, Hogenesch JB (July 2003). "Melanopsin is required for non-image-forming photic responses in blind mice". Science. 301 (5632): 525–7. Bibcode:2003Sci...301..525P. doi:10.1126/science.1086179. PMID 12829787. ^ Blasic JR, Lane Brown R, Robinson PR (May 2012). "Light-dependent phosphorylation of the carboxy tail of mouse melanopsin". Cellular and Molecular Life Sciences. 69 (9): 1551–62. doi:10.1007/s00018-011-0891-3. PMC 4045631. PMID 22159583. ^ Blasic JR, Matos-Cruz V, Ujla D, Cameron EG, Hattar S, Halpern ME, Robinson PR (April 2014). "Identification of critical phosphorylation sites on the carboxy tail of melanopsin". Biochemistry. 53 (16): 2644–9. doi:10.1021/bi401724r. PMC 4010260. PMID 24678795. ^ Fahrenkrug J, Falktoft B, Georg B, Hannibal J, Kristiansen SB, Klausen TK (December 2014). "Phosphorylation of rat melanopsin at Ser-381 and Ser-398 by light/dark and its importance for intrinsically photosensitive ganglion cells (ipRGCs) cellular Ca2+ signaling". The Journal of Biological Chemistry. 289 (51): 35482–93. doi:10.1074/jbc.M114.586529. PMC 4271233. PMID 25378407. ^ Sakamoto K, Liu C, Kasamatsu M, Pozdeyev NV, Iuvone PM, Tosini G (December 2005). "Dopamine regulates melanopsin mRNA expression in intrinsically photosensitive retinal ganglion cells". The European Journal of Neuroscience. 22 (12): 3129–36. doi:10.1111/j.1460-9568.2005.04512.x. PMID 16367779. ^ a b c d Koizumi A, Tanaka KF, Yamanaka A (January 2013). "The manipulation of neural and cellular activities by ectopic expression of melanopsin". Neuroscience Research. 75 (1): 3–5. doi:10.1016/j.neures.2012.07.010. PMID 22982474. ^ Jennifer Couzin-Frankel (2010). "Why Light Makes Migraines Worse – ScienceNOW". Archived from the original on 31 July 2016. Retrieved 3 April 2011. ^ Busskamp V, Picaud S, Sahel JA, Roska B (February 2012). "Optogenetic therapy for retinitis pigmentosa". Gene Therapy. 19 (2): 169–175. doi:10.1038/gt.2011.155. PMID 21993174. ^ Lin B, Koizumi A, Tanaka N, Panda S, Masland RH (October 2008). "Restoration of visual function in retinal degeneration mice by ectopic expression of melanopsin". Proceedings of the National Academy of Sciences of the United States of America. 105 (41): 16009–14. Bibcode:2008PNAS..10516009L. doi:10.1073/pnas.0806114105. PMC 2572922. PMID 18836071. ^ Tsunematsu T, Tanaka KF, Yamanaka A, Koizumi A (January 2013). "Ectopic expression of melanopsin in orexin/hypocretin neurons enables control of wakefulness of mice in vivo by blue light". Neuroscience Research. 75 (1): 23–8. doi:10.1016/j.neures.2012.07.005. PMID 22868039. ^ Lupi D, Oster H, Thompson S, Foster RG (September 2008). "The acute light-induction of sleep is mediated by OPN4-based photoreception" (PDF). Nature Neuroscience. 11 (9): 1068–73. doi:10.1038/nn.2179. hdl:11858/00-001M-0000-0012-DD96-A. PMID 19160505. ^ Ye H, Daoud-El Baba M, Peng RW, Fussenegger M (June 2011). "A synthetic optogenetic transcription device enhances blood-glucose homeostasis in mice". Science. 332 (6037): 1565–8. Bibcode:2011Sci...332.1565Y. doi:10.1126/science.1203535. PMID 21700876. Rovere G, Nadal-Nicolás FM, Wang J, Bernal-Garro JM, García-Carrillo N, Villegas-Pérez MP, Agudo-Barriuso M, Vidal-Sanz M (2016). "Melanopsin-Containing or Non-Melanopsin-Containing Retinal Ganglion Cells Response to Acute Ocular Hypertension With or Without Brain-Derived Neurotrophic Factor Neuroprotection". Investigative Ophthalmology & Visual Science. 57 (15): 6652–6661. doi:10.1167/iovs.16-20146. PMID 27930778.